All Things Dog Blog All Things Dog Blog: Easter, Passover and Earth Day Celebrations--Gone to the Dogs! How's This Look for Me? For posts like this one, I'm reasonably sure that Tanner wishes our rabbit, Robby, was still here to stand in. While Tanner is fairly amenable to posing in ears, he'll have them off within 10 minutes after I shut the camera off. I have to offer him #ASmartCookie in reward for his good nature and accommodation. Thanks Tanner! Today's giveaway prize announcement includes three winners who will each receive a grab bag for their Fido. These bags will include 2 bags of USA-made treats, a wallet-pack of Flushpuppies for better disposal of Fido's deposits, and either a toy or a leash. The latter will be selected based on the dog's size, for safety reasons. Our winners are Crystal R., Molly P, and Linda G. Watch for an email from us via AllThingsDogBlog@gmail.com. Check your spam file tonight if you don't find it easily, or feel free to write to us at this address with your full name, address and your dog's weight. If you'd like to receive an All Things Dog Blog bandana for your pup, please indicate this in your email and we'll include it along with your prizes. After this you can sit back and relax as we do the rest. Oh, and don't forget to watch for the goodie bag of Event Barkers perks inside. You'll find coupons, samples, helpful information from our sponsors and other goodies in this bag. Be sure to go through the contents carefully so you don't miss a thing! Speaking of Event Barkers, we're busy preparing for our next Twitter Party on behalf of sponsor Castor and Pollux Pet. #OrganicPet is sure to be a bit hit as we'll have experts on hand to answer your questions about their products, new introductions, and the value of purchasing an organic food for your pets. And did I mention there will be prizes? Mark your calendars for May 4 and click through to the post hashtagged above to RSVP and enter our pre-party giveaways. You could be a winner without even attending! No matter which holiday you're celebrating at this time of year, be sure to enjoy the moment as you spend time with family, friends and your dog. Each day is precious and we all need to savor them. I'll look forward to seeing you tomorrow for the next pose in our Doga series: Forward Fold with Fido. Flush Puppies flushable dog waste bags have been provided to All Things Dog Blog for promotion by giveaway. I was not compensated to offer this giveaway or to share information about this product. I do use Flush Puppies in my own home and love that we are not adding immeasurably to the waste bags in landfills. 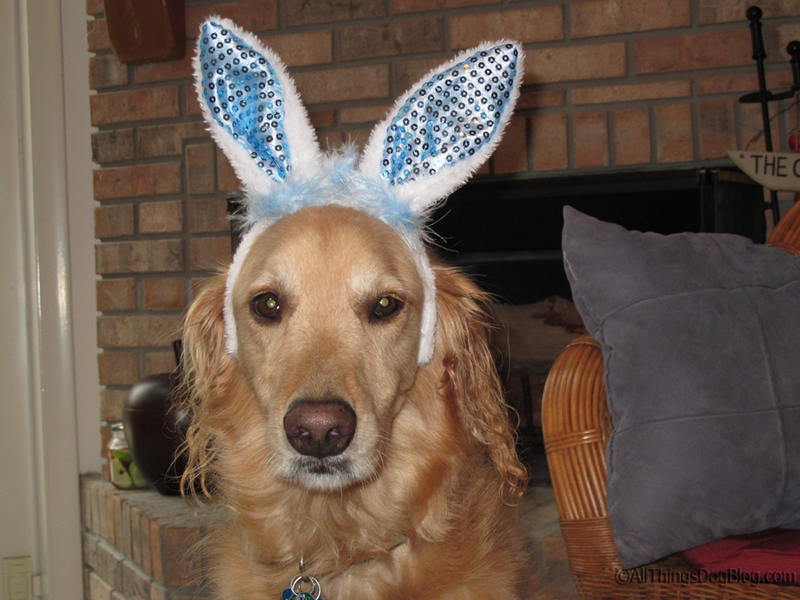 The Easter bunny ears used in the photos were provided by Petco for an earlier promotion. Thanks Petco! Oooh...I hope that Molly P is me. Have a great weekend Carrie with your furbabies! Tanner looks so good with those ears. Have a great Easter.